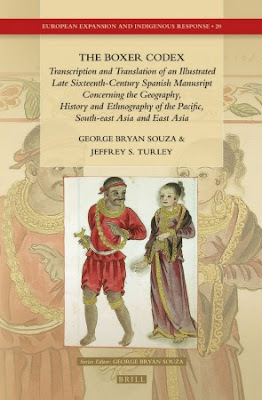 THIS week’s article continues on the narratives of the chapter on Brunei as written in the Boxer Codex. The Boxer Codex is a book written about Philippines and the surrounding region during the Spanish administration around the late 16th century. The Boxer Codex was found in 1947 by a British Historian named Professor Boxer. The Boxer Codex noted that the current Sultan of Brunei was Sultan Nur Alam, who used a different name when he was a prince, Sultan Rijal. The Codex also noted that Brunei had two different people, one was the Visayans, who were not Muslims and the other people was the people of the Islamic religion and these people were not originally from Brunei. 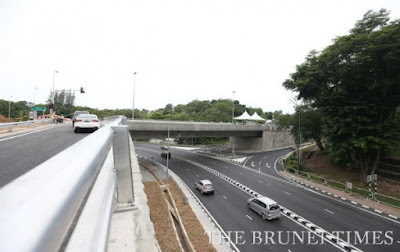 A NEW flyover at Jalan Babu Raja and Jalan Raja Isteri Pengiran Anak Saleha is now open for motorists. According to the Public Works Department (JKR) at the Ministry of Development (MoD), the flyover is one of the projects under the 10th National Development Plan (RKN 10). The $20.2 million flyover, which began construction on June 20, 2012, was contracted to Tobishima. According to JKR, the project is aimed at accommodating the increase in traffic, and at the same time, ensure safety of road users. The new road development is also aimed to enhance the road networks where motorists are able to have more access. Traffic light systems have also been installed to ensure road safety. JKR said the flyover could also reduce traffic congestion at Jalan Raja Isteri Pg Anak Saleha. Present at the launching yesterday was the Acting Minister of Development Dato Paduka Hj Suhaimi Hj Gapar. 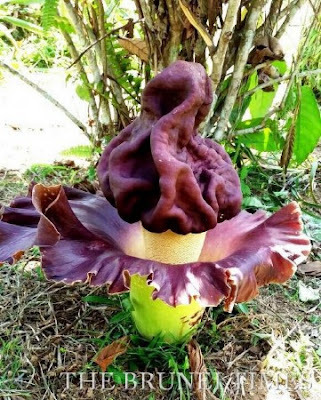 A PECULIAR-LOOKING plant growing naturally on the lawn of a 66-year-old woman in Kg Lumapas was identified by Heart of Borneo Centre Chief Executive as the ‘Amorphpophallus paeoniifoluis’ or stink lily. “If it grows naturally the plant’s recent discovery would be the first recorded case of it ever growing in the sultanate,” said the chief executive of Brunei HoB Centre Mahmud Hj Mohd Yussof. The plant, according to information on the ASEAN centre of Biodiversity’s website, is one of two of the largest flowers in the world found native to Borneo Island. The 66-year-old senior citizen who made the discovery, Murah Namit, initially described her find as “A leafless flower stalk growing directly from the ground” which has started growing progressively since Thursday. HIS Majesty Sultan Haji Hassanal Bolkiah Mu’izzaddin Waddaulah, the Sultan and Yang Di-Pertuan of Brunei Darussalam, has called for greater multi-agency cooperation in tackling the emergence of transnational security threats. 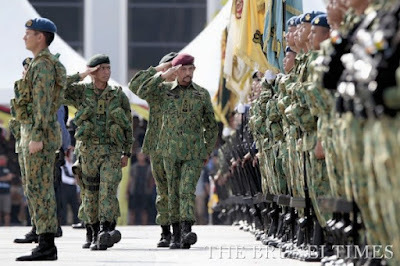 The Defence Minister and Supreme Commander of the Royal Brunei Armed Forces (RBAF) yesterday said the world is facing a multitude of security challenges across international boundaries. In a titah at the 55th RBAF anniversary celebration, the monarch said the sultanate is “not exempted from the possibility of encountering” traditional and non-traditional security threats such as terrorism, maritime and cyber security as well as natural disasters. His Majesty further underscored the need for cooperation not only among security agencies in the country, but also at the international level.